This book is a dual nonfiction story of two young activists that use their power of speech to create awareness as well as start a movement against social injustices. In the first story a girl from Mingora, Pakistan persevered against the Taliban, a group of religious extremists, that began to prevent girls from going to school. Stressing the importance of equal access to schooling for women, the eleven year old Mandala rallies the girls in Swat Valley. Though Mandala faces numerous threats of violence, she continues to lead the girls to rebel and attend school. Despite the resistance that Mandala has created against the Taliban threats, the town is bombed and the schools are set on fire. This doesn’t defer the persistent girls from their education, but makes traveling to school more dangerous. One day Mandala is shot by a Taliban fighter, and faces death. Even after the horrible occurrence of almost dying, Mandala still continues to speak and advocate for women’s rights. She has earned awards like the Peace prize, Mother Teresa Memorial International Award for Social Justice, and Children’s Peace Prize. 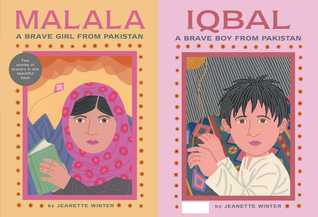 The second part of the book follows a four year old boy named Iqba, who is sold as a slave in a carpet factory in exchange of a family debt. Earning only twenty cents a day for long vigorous hours, Igba alongside hundreds of other children, occupied sweat shops. In Pakistan a loan that holds children captive is called a Peshgi. One day Iqba learns that laws have uplifted the Peshgi law, which set all the children free. Investing in his future, Iqba starts to spread his message of freedom to other enslaved children. After receiving death threats, he was unfortunately murdered and mourned by hundreds in Pakistan. How does it represent Element 3: Exploring Issues of Social Injustice? Element 3: Exploring Issues of Social injustice is reflected in this book because it touches on the issues of sexism, equality, and classism. This narrative is written in a detailed but simplistic diction that young readers can articulate how inequalities affect social structures in other communities. In this book, the author expresses the importance of fighting for social justice. Regardless of what age you are, even as a child, your voice holds power. This book shows how important standing up for your rights even if it may be dangerous. It demonstrates how anyone can be the forefront of their own revolution, and how organizing together can build power in numbers to bring down systems of oppression. Using the two heroic characters Mandela and Igba as an example of how it’s never too young to be a hero, use the story to help students define the meaning of bravery. Have student’s analyze how the two main characters use their brave voice to advocate for children rights. Explain that bravery can be a small act of standing up for oneself, or it can be bigger effort to create change in their own community. After coming up with a class definition, ask students to brainstorm acts of bravery they’ve seen done by peers, done themselves, or would like seen done in the future. Discuss why it’s important to be brave in tough situations when facing an obstacle. Start a campaign for bravery, and celebrate acts of bravery seen in the classroom or within school. Finally address issues in the classroom or in the school that still need these acts of bravery to make school a safe equitable place for all children.